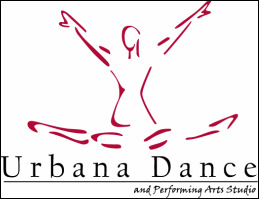 Urbana Dance Studio (UDS) offers a wide variety of dance forms including pre-ballet, ballet, jazz, tap, hip hop, dance fitness, and much more. Through artistic collaborations and community partnerships, we strive to create meaningful performing opportunities for our students rather it be for the recreational dancer and/or the competitive dancer. Each dancer has the opportunity to experience the elements of dance confidence, creativity, grace, musicality, rhythm, self-esteem, technique, and appreciation for music and dance. UDS recognizes each dancer as an individual and our focus is on improving their natural talents and abilities in a fun, encouraging and supportive atmosphere. The UDS curriculum provides each student with a very good technical grounding and gives each dancer the best opportunity to maximize their learning potential. Classes are run to help build self esteem, learn about the art of dance, and most of all for fun! We accommodate all potential dancers whether you are joining us to explore dance for the first time or you are looking to become involved in a solid recreational dance program or looking to further your dance education to the highest level possible. Urbana Dance is the place for you. Come join our family fun atmosphere. Urbana Dance Studio offers students of all ages and abilities classes in ballet, jazz, tap, hip hop, modern, creative movement and tumble. From age 2 1/2 to adult, Urbana Dance is focused on providing high-quality service and customer satisfaction. UDS classes are taught by experienced and knowledgeable professionals who collectively have a wide variety of dance experience and training. Our Faculty Page contains each instructor's picture and bio. Check it out to view their education, experiences and what each instructor brings to each class and to their students. Classes at Urbana Dance are properly sized for proper education, with student placement based upon age, ability and experience. For more information, please refer to our Schedule or contact us directly so we may recommend which classes best fit your abilities. Do you have a love and passion for dance? Urbana Dance introduces "Urban Fuse," our competitive dance team for those wishing to pursue a more intense program. Urban Fuse dancers are age 5 through early adult. Some dance team members spend up to 8-10 hours a week training and perfecting their technique. Dance team members audition every summer for a spot on one of our dedicated teams. Urban Fuse has successfully competed on regional and national levels, and receive master workshop training at highly renowned dance conventions and competitions in the United States.